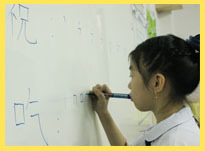 Thunyawit School offers Chinese as a third language starting from kindergarten grade 1 to primary grade 6. Children, who learn Chinese at young ages, will have better opportunities to develop native-like pronunciation and intonation. Language learning is a natural process when children are young. Therefore, they will have a concrete base for the Chinese studies in the future. We create a friendly learning atmosphere through playing and exploration. Fun activities as games, music and rhythm are introduced into language teaching. Our curriculum includes pinyin（拼音）,the standard Chinese pronunciation system to represent characters using Roman letters, everyday conversation（日常用语）, character writing （笔顺）and Chinese songs（歌）. 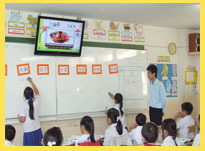 Children are taught by experienced and qualified native Chinese teachers and Thai teachers who are specialized in the Chinese language. We use Chinese as the main classroom language. We use authentic Interactive CD-Rom, DVD, comics and cartoons from China as our teaching materials. The children not only develop their Chinese language proficiency, but also Chinese culture through different activities such as songs and Chinese festivals and celebrations.